BOYLE HEIGHTS (CNS) – Firefighters needed 13 minutes Sunday to knock down a fire that destroyed a stand-alone garage and threatened a home in Boyle Heights, according to the Los Angeles Fire Department. The blaze inside a garage at 1016 N. State St., was reported about 5:25 p.m., fire department spokeswoman Margaret Stewart said. Firefighters managed to keep the flames confined to the garage and protected the home in front, Stewart said. The department dispatched 30 firefighters to the scene. 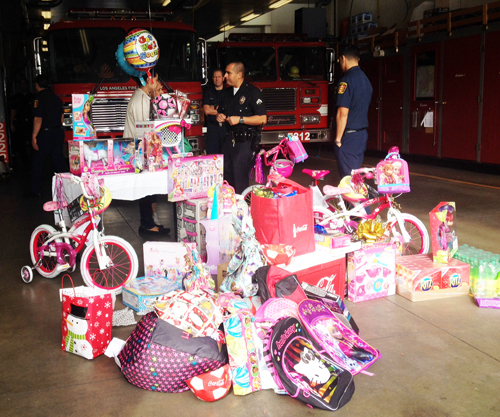 When Blanca Rodriguez received the call from the Los Angeles Police Department’s Northeast Division last week that officers were on their way over to pick her up, she never imagined they would be taking her to a fire station in Highland Park where Santa Claus was waiting with gifts for her entire family. A month ago, no one was even sure she would be alive this Christmas, the victim of a brutal and near fatal stabbing attack in her Highland Park home. “I was very happy, it was a big surprise for me,” said the mother of three, glad to be alive. On Nov. 20, a man knocked on Rodriguez’ door asking for her husband Jose who was at work . “Without saying anything else, he pushed the door and started stabbing me,” recalled the still shaken woman. “I asked him, ‘What did I do? Why are you hurting me?’ but he wouldn’t say anything,” she said, unable to hold back tears as she described how she tried to fight off her knife wielding assailant. She was terrified; her two-year-old daughter was also in the house. “Somehow, I was able to push him away and he ran out of the house,” said Rodriguez. But not before he nearly killed her. When it was all over, Rodriguez had been stabbed 12 times in the chest, neck and face. The final stab hit her heart. Bleeding profusely, she somehow managed to get out her door and scream for help. When the paramedics arrived at the home on Polar Street, Rodriguez was near death. “She was in front of her apartment, unconscious and [barely] breathing,” Michael Hayes, a paramedic assigned to the LAFD Highland Park station told EGP. Right away they noticed that her vital organs were damaged. When LAPD detectives went to the hospital to question Rodriguez about what had happened, they found her in very serious condition. “We thought she was going to die,” Sgt. Roberto Alaniz of the Northeast Division told EGP, incredulous she had survived. Rodriguez required open-heart surgery and spent nearly a month in the hospital before being allowed to go home, barely able to walk and wearing a colostomy bag. Recovery, physical and emotional, will take a long time. Police and firefighters were so moved by Rodriguez’s case they felt compelled to do something to help her and her family, especially her three daughters, ages 6, 4 and the two-year-old who was at home during the attack but not harmed. If nothing else, they wanted to relieve some of their pain and maybe bring them a little good cheer during the holidays. Northeast police officers reached out to local organizations and companies for help and last Thursday the Rodriguez family was treated to the fruits of their compassion: bicycles, school supplies, toys, food and gift certificates for the family. “LAPD ran [the toy giveaway] and asked our [Spark of Love] toy drive personnel if they wanted to get involved,” said the fire department’s Hayes. “Obviously, the scene between then [when the attack took place] and now was very different,” he said, noting how happy Rodriguez looked with her family. Hayes, and the other paramedics who assisted Rodriguez in the aftermath of the attack, LAPD detectives, and other donors were on hand to help celebrate Rodriguez’s survival and recovery. The store manager of the Superior Grocers in Highland Park, Matt Kovacs, said he was asked by Sgt. Alaniz to donate food and gifts to the family, and the company’s foundation responded by donating gift cards for “a Christmas feast.” He was also able to secure donations from Coca Cola and the Bimbo bread company. Holding a bouquet of flowers, steadied with support from a neighbor helping to care for her, Rodriguez slowly walked around the bounty of gifts, overwhelmed by the outpouring of support from her community. She told EGP she’s still afraid to go home, tortured by flashbacks of that horrendous day when her life nearly ended. The scars on her chest and face, which may never disappear, are a constant reminder, but it could have been worse, she said. She could have died, she said. What matters now are her daughters, seeing them running around and happy, she said. “They don’t know what happened to me,” she said. “My oldest daughter thinks I was run over by a car,” she says with a slight smile on her face as she thinks about the lie to spare them from the truth. Five days after the brutal attack, police arrested and charged Ricardo Gomez Alanis, 22, with Rodriguez’s attack. Described by police as a gang member, Alanis was in court Monday where he was charged with one count of attempted murder. If convicted, he faces 15 years to life in prison. Bail was set at $1 million. His next court date is Jan. 22, 2015. Police have not released a motive for the attack, but Rodriguez said she believes he had worked with her husband.